Where art rises above skill and virtuosity, the name of Damayanti Joshi, a leading exponent of Kathak occurs to the lovers of Indian dance. She was born in 1932 at Mumbai and started dancing very early in life. As child she was trained in Kathak. She has danced in China, Japan, Sudan, Egypt, Syria, Iran, Turkey, Greece, and for the United Nations troops at Gaza. She has been to GDR, Poland and Russia, Nepal and the above mentioned countries as a member of the Govt of India's Cultural Delegation. Apart from all this, she had undertaken a highly successful tour of UK, France, Germany, Austria, Hungary and the continent of Europe. In 1969 she had been to Afghanistan as a member of the Prime Minister's Delegation and in the same year had performed at the Gandhi Darshan Exhibition at Delhi. 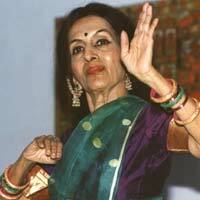 She was the only dancer from Bombay to perform at UNCTAD II. She has performed for the visiting dignitaries, such as the Presidents of Russia, Philippines, Indonesia, Poland, Mexico, Laos, China, Yugoslavia to name a few and at international conferences and festivals like the I.L.O., Parliamentary Delegation, Ambassadors, World Agricultural Festival, International Medical, Bankers Conference and many others. She has also given commendable performances before their Majesties of Afghanistan, Nepal, Bhutan, Spain etc. She started her dancing career in All-India Music Conferences. She made mark for her Tala aspect, and also in Nritya, and was acknowledged as the best exhibitor of the Ashta Nayikas, which came to be known as a solo ballet. She studied and choreographed the sculptures at Khajuraho for her solo ballet on the SURASUNDARI in Kathak technique. She also choreographed Dhrupad, Khayal, Thumris, Trivat, Taraua and Chaturang in Kathak, and was the first Kathak dancer to do it. At a tender age Damayanti travelled along with Menaka all over India, South East Asian countries, including Burma, Malaya, Singapore etc. throughout undivided India, Sri Lanka etc. She had her early training from Sita Ram Prasad and later from Achchan Maharaj, Luchchu Maharaj and Shambhu Maharaj. In Jaipur Gharana she had training from Hira Lal. Besides Kathak she has also learnt the other three classical schools, viz, Bharat Natyam, Kathakali and Manipuri from the respective stalwarts, and performed them at many places. Her honors among many, include Sangeet Natak Akademi, New Delhi's Award for Kathak (1968), Padmashree (1970), titles such as Nritya Bhushan, Nritya Sharada, Nritya Vilas etc. Photo and account in Encyclopedia Brittanica (Latest Edition). She is mainly featured in the documentary on Kathak in 1973 by film division, Govt of India and another film entitled Damayanti Joshi in 1974. In the early morning hours of Sunday, September 19, 2004, Damayanti Joshi, breathed her last.